In recent years, knot theory and low-dimensional topology have been effectively used to study the topology and geometry of DNA under different spatial constraints, and to solve the topological mechanisms of enzymes such as site-specific recombinases and topoisomerases. Through continuous collaboration and close interaction with experimental biologists, many problems approached and the solutions proposed remain relevant to the biological community, while being mathematically and computationally interesting. In this paper, we illustrate the use of mathematical and computational methods in a variety of DNA topology problems. 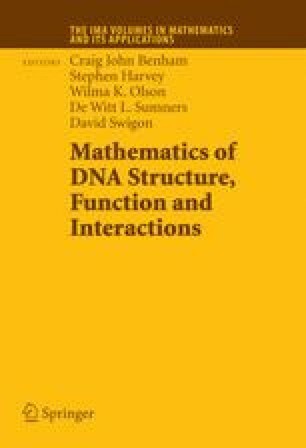 This is by no means an exhaustive description of techniques and applications, but is rather intended to introduce the reader to the exciting applications of topology to the study of DNA. Many more examples will be found throughout this book. I.K. Darcy, J. Luecke, and M. Vazquez Tangle analysis of difference topology experiments: applications to a Mu-DNA protein complex, IMA preprint series, (2008),http://www.ima.umn.edu/preprints/oct2007/2177.pdf.